On Saturday, May 11, 2019 over 1,500 people will unite at Carson Beach to participate in the 18th Annual Boston Marine Corps Honor Run. Awards Ceremony with great prizes, and more! The distinctive spirit of hundreds of military and law enforcement officers is pervasive throughout the day. Groups will be running in formation, local honor guards will be onsite, as well as Marine Corps Cadets to help warm your muscles up. Race participants will include active duty officers and veterans from all branches of the U.S. Military and local law enforcement groups. But don’t be fooled, this event is for EVERYONE. We welcome beginner runners, walkers and elite athletes alike. All you need is your sneakers and patriotism! The Marine Corps Scholarship Foundation is the Nation’s oldest and largest provider of need-based scholarships to military children, with particular attention given to those whose parent has been killed or wounded in combat, or who have demonstrated financial need. Since its inception in 1962, the Scholarship Foundation has awarded over 40,000 scholarships valued at nearly $125,000,000. There were 2,300 scholarships awarded this past year. Our 2019 Honored Hero is Corporal Christopher J. Orlando of Hingham, MA. This phrase struck a chord with Chris Orlando, but no one knew how profound it would become until January 14, 2016. Flight Crew Chief Corporal Orlando’s dash was cut far too short at the age of 23 when he and 11 fellow Marines were killed during a nighttime training mission when two CH53 helicopters collided off the coast of Hawaii’s Island Oahu. 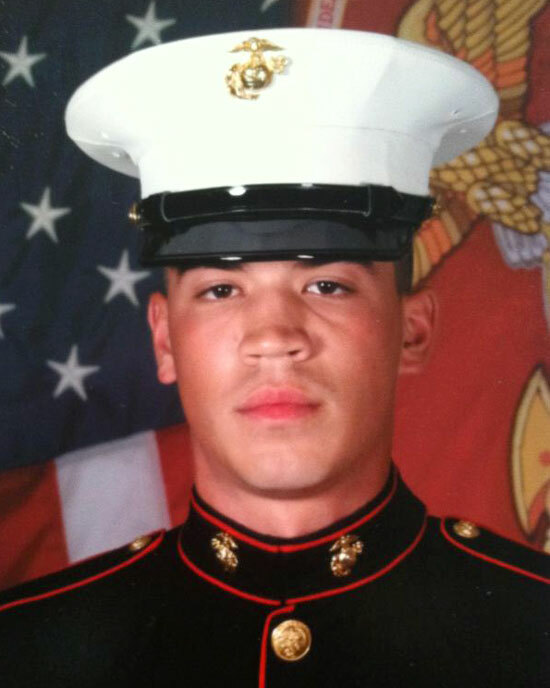 A 2010 graduate of Hingham High School, Corporal Orlando joined the Marine Corps in the summer of 2012. During his four years of service, Orlando was awarded the National Defense Service Medal, the Global War on Terrorism Service Medal and Sea Service Deployment Ribbon. Corporal Orlando loved his job, but his true commitment and dedication was fueled by the comradery amongst his fellow Marines. A true testament to Corporal Orlando’s character was the members of his squadron who said they would have traded places with him, had they known what was ahead. But steadfast in his ways, Orlando would not have changed the outcome, or his path of military service. A winning smile, unique sense of humor, loyalty, courage and adventurous spirit are the qualities Corporal Orlando will be remembered by. Much like his time in service, the company Orlando kept comprised of decade-long friendships and bonds with cousins more reminiscent of siblings. Corporal Orlando is survived by his parents, Richard and Linda Orlando of Hingham, his sister and brother in-law Gina and Brian Devine of Hingham, his brother and sister-in-law Joseph and Amber Orlando and nephew Noah of West Bridgewater, grandparents, many aunts, uncles, cousins and countless friends. Although sorely missed, Corporal Orlando’s legacy lives on. Honor him by making the most of your dash. Check or credit card only are accepted. Please do not send cash in the mail. Mail-in entries must be postmarked by Monday, May 6, 2019. If you would like to make a donation, please make a check payable to Marine Corps Scholarship Foundation and mail to the address above. Online registration is available until 5:00 PM on Thursday, May 9, 2019. All participants will receive an official race T-shirt! Participants can pick-up their bib numbers and T-shirts on race day at the registration tent beginning at 7:00 AM. PLEASE ARRIVE EARLY TO AVOID LAST MINUTE LINES! Refund Policy: Sorry, refunds are not available for this event. I hereby for myself, my heirs, executors, and administrators, waive and release any and all rights and claims for damages I may have against Conventures, Inc., its affiliates and subsidiaries, and their respective officers, directors, employees, sponsors, coordinating groups, and any individuals associated with the event, their representatives, successors, and assigns, and will hold them harmless for any and all injuries suffered in connection with this event. I attest that I am physically fit to compete in this event. Further, I hereby grant full permission to any and all of the foregoing to use my likeness in all media including photographs, recordings, my story, or any other record of this event for any legitimate purpose. Join the fun on race day! If you do not wish to run but still want to be involved, we encourage you to lend a hand. Assistance will be needed at water stations, number pick-up, the finisher area, and along the course. All volunteers will receive an official race T-shirt. If you are interested in receiving information regarding sponsorship opportunities for the race, please contact Brooke Maher at bmaher@conventures.com. This is the flattest and fastest course you will find in the Boston area. Perfect for beginners or for experienced runners looking for a PR! The start of the race will begin at DCR’s Carson Beach/Mother’s Rest Area. Runners will run northbound on Day Boulevard making a hairpin turn just before the intersection of Day Boulevard and Farragut Street. The participants will return to Carson Beach traveling southbound on Day Boulevard. 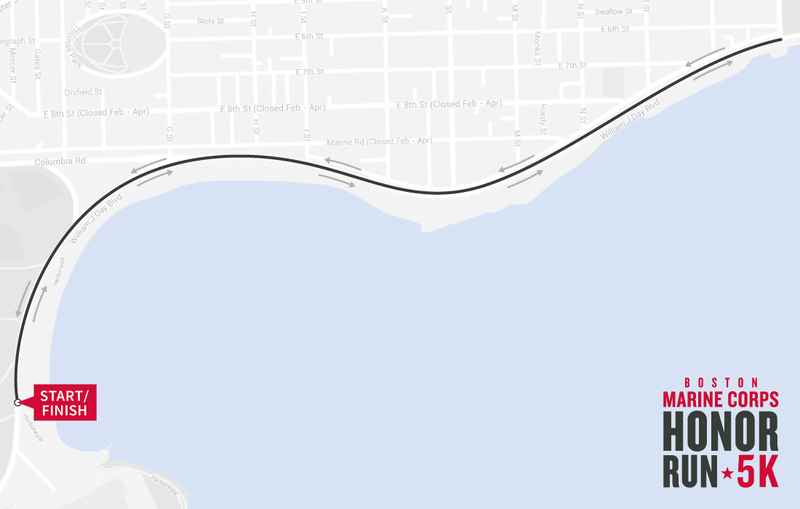 This event will effectively close Day Boulevard from 8:30 AM until 10:00 AM, as well as cause traffic delays at Kosciusko Circle, Mount Vernon Street and Columbia Road. The closest station is JFK/UMass (Red Line and multiple bus lines), which is a short walk from the start. See the map below for other nearby bus stops or visit mbta.com for more information. From the West: Mass Pike east to I-93 (I-95) South. Exit 15 off the Expressway. From the North: Exit 15 off I-93 (I-95) North, left at end. From the South: Exit 14 off the Expressway, follow Morrissey Boulevard, either go up to the rotary or crossover Mt. Vernon Street up to Day Boulevard or Exit 15 off the Expressway right at end. Free parking will be available. Follow signs to designated parking areas. © 2019 Boston Marine Corps Honor Run 5K. All Rights Reserved.